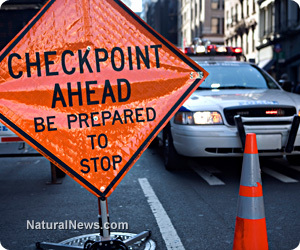 (NaturalNews) More and more police departments are dropping out of a "voluntary" federal government traffic checkpoint program that aims to curb drunken driving and driving under the influence of drugs as it comes under increasing criticism in cities around the country. In some cases, workers at the checkpoints collect blood and saliva samples, in addition to breath samples. NHTSA has said previously that the surveys do not collect any DNA. Drivers are not charged at the checkpoints. But the problem is nearly entirely political. In an age where fewer and fewer Americans trust or believe the motives and stated objectives of federal agencies and departments, and in the wake of the Obama administration's National Security Agency surveillance scandal - in which the agency has been collecting electronic communications records on millions of unsuspecting Americans - the checkpoints have come under intense fire from citizens this past year in cities where they have been set up. "Five years ago it would have been a different story," says St. Charles County, Mo., Sheriff Tom Neer, who told the paper that he recently authorized deputies to participate in a checkpoint in his St. Louis suburb - then witnessed a major backlash from the public. "There're just such strong anti-government feelings among people. Under the circumstances, I would not allow them to do it again. It's just because of the perception," he told USA Today. The highway agency has been collecting surveys for about four decades in cities around the country, roughly every 10 years or so. In a number of cases, off-duty, uniformed police randomly wave motorists over to the checkpoints where they are asked by Pacific Institute for Research and Evaluation subcontractors if they would like to participate in the voluntary study. Drivers who say no, they would rather not, are allowed to leave. [T]he mere presence of uniformed officers gives the checkpoints an aura of authority, says Mary Catherine Roper, a senior staff attorney with the American Civil Liberties Union of Pennsylvania. She is studying the issue there after motorists complained about a survey checkpoint last month in Reading. "We have a whole bunch of rules about when police can pull you over," she says. "It looks like an exercise of official authority when a cop pulls you over. People assume it's mandatory, and of course you're going to stop. That's a constitutional problem right there. "Normally, police cannot pull you over unless they have a good reason for thinking you've done something wrong," Roper told the paper. "There's no exemption to the Constitution for conducting a survey. They're pulling people off the road." She says further that "there are lots of other places you can talk to drivers. You could hand out notes at a toll booth asking them to participate. You could do them at highway rest stops. There are a lot of ways to do this that do not involve... the government forcing you off the road." As you might expect, the government agency conducting the surveys defended its actions by completely dismissing the constitutional argument. "Each year, close to 10,000 people die in drunk driving crashes: 27 people a day, or one person every 53 minutes, according to data (from NHTSA)," the NHTSA statement said, as reported by USA Today. "To better understand the issue, the agency has regularly conducted its National Roadside Survey of Alcohol and Drugged Driving in communities across the country for over 40 years. The survey provides useful data about alcohol and drug use by drivers, and participation is completely voluntary and anonymous," said the agency. "More than 60 communities across the country will participate this year, many of which participated in the previous survey in 2007. NHTSA always works closely with state and local safety officials and local law enforcement to conduct these surveys as we work to better inform our efforts to reduce drunk and drugged driving," it said. So, in other words, because the effort is supposedly honorable - enhancing public safety - the Constitution doesn't really matter. Mike Adams, the Health Ranger, covered this subject last summer. Read his report here.